Jarred by the notion of someone dying in the company of a machine instead of loved ones (or at least other humans)? That’s partly the point. Chen, an artist, designer, and engineer who just graduated from the Rhode Island School of Design with an MFA in Digital + Media, built the machine as one of a series of functional robots capable of reenacting human social behaviors. But just how much can a machine impart comfort and security? It’s a fascinating, complex question, and one Chen explores in his master’s thesis titled “File > Save As > Intimacy” (PDF), a study of interactions based on what he calls robotic intimacy technology (RIT). 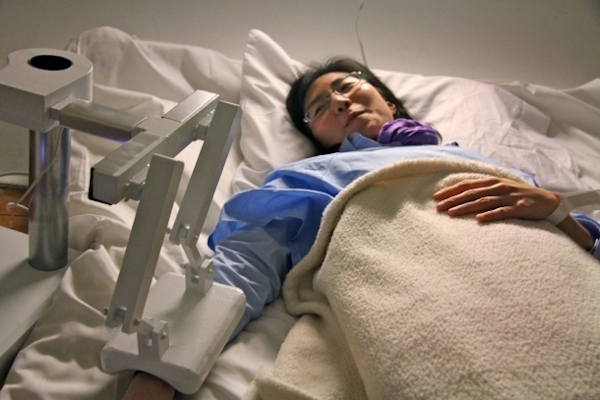 Among Chen’s hand-built RIT creations are a hugging robot that uses a proximity sensor to detect incoming objects and then wrap its arm around them; a purring machine that produces low-frequency vibrations that can be felt through the body when held to the chest; and Okay Therapist, a little box that provides customized words of comfort in the event of depression or uncertainty. All of these are built on the Arduino platform, and all have elements of charm, and even humor. Then there’s the Last Minute Robot, the most extreme, and arguably chilling, of his prototype devices. It consists of a padded caressing arm and a mechanical recorded voice designed to guide and comfort dying patients with a carefully scripted message (which can at least be personalized to get their name right). The public has been introduced to the machine as part an interactive art installation called Last Moment Hospital displayed at a RISD show earlier this year, as well as at Brown University Science Center. Medical bracelets, health information forms, and other related medical products transform the space into a hospital-like environment where people go for a fake final rite of passage. A hospital bed sits in an empty room lit with a single fluorescent light; the Last Moment Robot is situated by the bedside. “I put part of myself into the robot, things such as what I would say to a dying person and how I would touch and comfort them,” says Chen, who hopes to move to San Francisco and find work in robotics now that he has completed his degree. He does not have plans to push his Last Moment Robot past the prototype stage at this point, but says he can see it being used to sit with the dying in cases where other sources of comfort might be absent. Machines that provide comfort or intimacy are far from the stuff of science fiction. Chen’s Last Moment Robot and accompanying installation were inspired by Paro, a therapeutic baby seal robot used in nursing homes in Japan and elsewhere to comfort the elderly and isolated. Paro was also used to comfort victims of last year’s earthquake and tsunami in Japan. Therapeutic robots have been used with other populations as well, including autistic children. But the idea of what is, in essence, a robot hospice worker, pushes the conceptual boundaries of human-machine interaction to places some people might not be ready to go. Which is precisely what Chen wants to do.